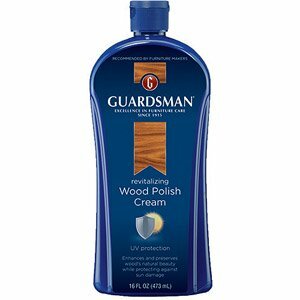 Alex shared her Guardsman Furniture Polish review, specifically about the wood polish cream. I have a lot of wood furniture and occasionally the pieces lose their shine and polish. When I have a party coming up or a large gathering I make sure that everything looks as nice as possible. Recently I decided to polish up my wooden cabinet, cabinet doors and coffee tables. I wanted to purchase something with good reviews so I went on Amazon and purchased the Guardsman furniture cream. It's in liquid form and not in spray form, so it is a bit more involved. However, it is well worth the extra effort, and is amazing. It takes several hours to fully dry but afterward the results are spectacular. You get a natural looking shine no matter what finish is on the wood. Also, small scratches that I had are now barely visible. If one's in the market for the best wood furniture polish, I'd recommend this one! Thanks so much for your review of this product Alex. I'd love to hear from even more people who've used this cream polish, or really of the Guardsman wood care products, since they have quite a variety of them. You can share your reviews of any products from this brand here, and I'll add them to the site.